To be honest, I wasn’t all that impressed with the arts and crafts this year. Amongst the paintings and photographs there was nothing truly memorable, and thematically I thought the works could have come from any time in history, as opposed to a time of one of the worst droughts in recorded history. In cake decoration, this year, I noticed a trend towards floral imitation. In the District Exhibits, there was nothing spectacular, although I agreed with the “People’s Choose” decision of Northern NSW, as I thought the moving butterfly was very good. I thought the fruit cakes were quite good this year, with hundreds on display. 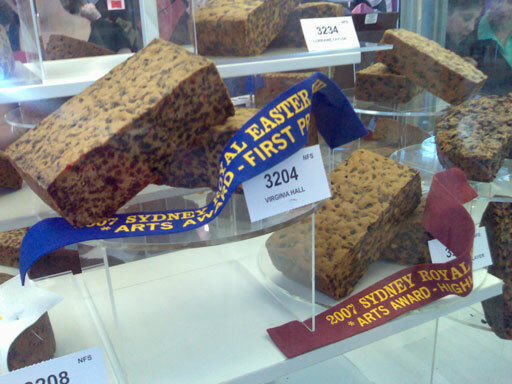 Possibly the biggest fruit cake display I can recall in the many years I’ve been going to the show.